Dear 1/72 scale fans, sorry for the long wait!! This is the Ho 229 currently under development and the cute 1/144 Horten. 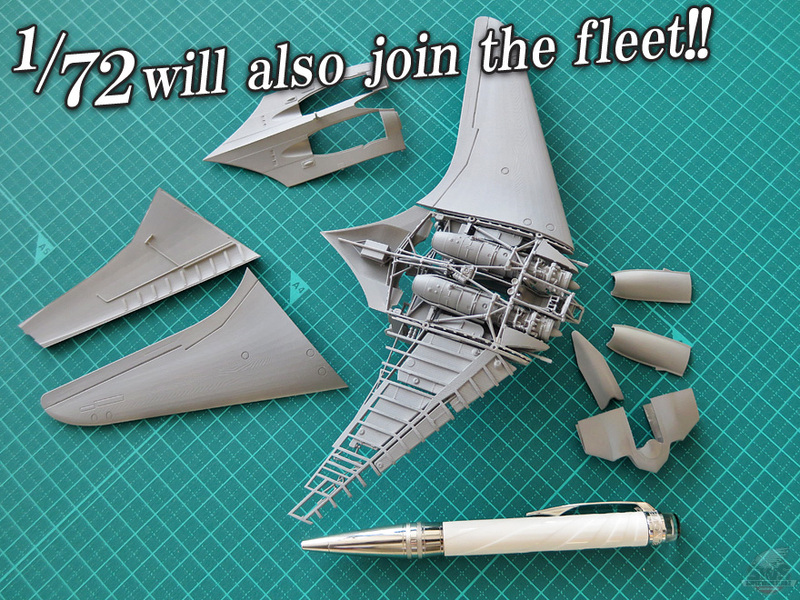 You already know the contents of the SWS Horten in 1/48 scale so I assume you don't need any explanation but this is how far Zoukei-mura went even in 1/72 scale! Moreover, the one in 1/144 scale will be a bonus! ▋On the right, my favorite Mont Blanc, 13cm long; on the left, my hand. From the engine to the interior structure, Zoukei-mura's soul shines bright even in 1/72 scale. 1/32, 1/48, 1/72 and 1/144 scale, the sky of your hobby room will have a Horten fleet flying high real soon!! ▋Development is proceeding with clear parts for the skin so that internal structure can be seen, even in 1/72 scale. The uniqueness and the majestic design of the Ho 229 that recently revived with the SWS kits are just outstanding. Yay. Thumbs-up! And all hopes for Tank Ta-152 in the 72scale too!